In the software development world there are, broadly speaking, two groups of people: those who create the software (coders, testers, etc.) and those who manage the process (project managers, development managers, etc.). When discussing "Agile" I find that both sides think the problem is with the other. To put it another way, if I'm talking to developers they think its managers who are the block to adopting more Agile techniques and improvement. But when I'm talking to managers they say its the developers who resist Agile and other improvements. Agile isn’t someone else’s thing, it doesn’t belong to another person: Its yours. You are as likely to be the block as the person you think is the block. The first thing to note about all these techniques - and indeed the majority of what we tend to call “Agile” - is that these techniques work on the supply side. 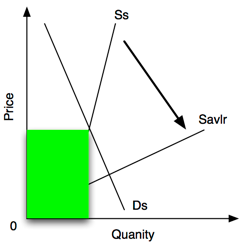 They operate on the supply curve, the net effect is to increase supply. Possibly, if used in the right fashion, BDD and SbE might effect the supply side. But since most of the efforts to use BDD I encounter are little more than super-charged TDD we’ll leave it there for now - see Dan North’s blog for a better discussion BDD v. TDD. 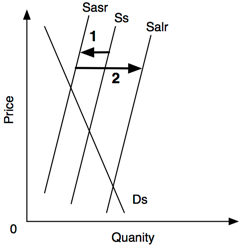 A team starting on Ss can expect to move left (1) to Sasr (agile short run) before moving to the right (2) - Salr (agile long run) - reduced supply before greater supply. 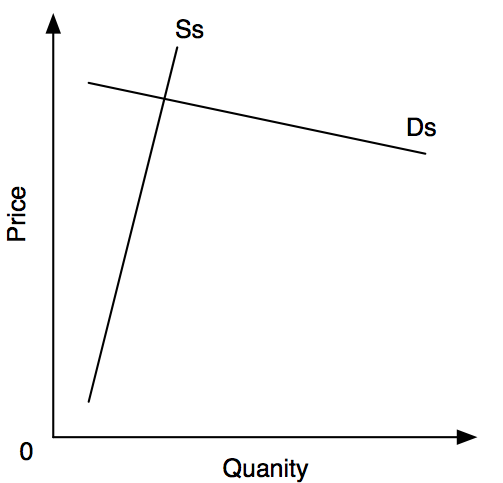 In the first instance the price per unit increases while the quantity delivered falls but after the second move the price per unit falls and the team produces more software. But I think something else happens. This is a hypothesis, at the moment I can’t measure it so please tell me - in the comments on this blog - whether you agree or think I’m wrong. Short iterations and regular releases make it cheaper to make small changes. Therefore the supply of the small quantities of can should take place at a lower cost. And since the delivery - or at least a demo - is earlier the whole “project” could be cancelled if things don’t work out. Thus the bottom of the curve moves left over time. The same techniques - TDD, ATDD, etc. - and shared code ownership also make it easier for new engineers to become productive because a) there are more code examples of how the system works and b) places a safety net under any work they do, allowing them to experiment and learn faster, and get their changes to production sooner. The net consequence of these changes is to flatten the curve, not entirely but certainly reduce of an angle. In economics terms we increase the elasticity. 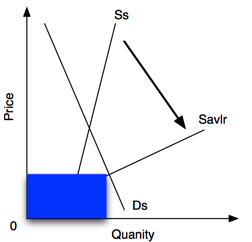 Changes in price - adding or removing a developer - causes a bigger effect on the quantity supplied than before. Now if you are producing software for your own company - either to resell (e.g. Microsoft) or to consume yourself (e.g. a bank) - this model is good news. You get more software for a lower overall spend. Although I don’t think I’ve ever stated it I operate a “no revisions” policy to this blog. I don’t take things down, and I rarely modify past entries. OK, I might change it in the 10 minutes or so after I first post to fix typos and gaffes I see once I see it online but otherwise I avoid doing so. 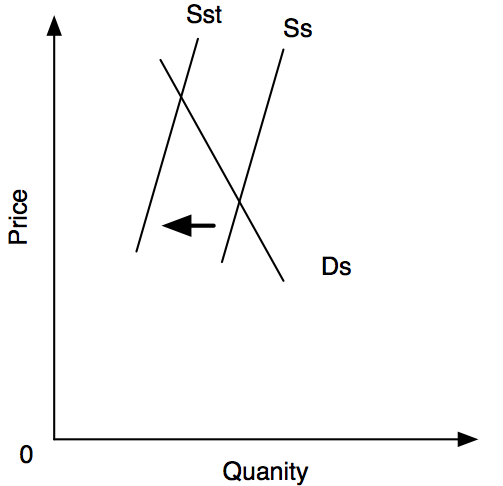 But my recent posts on software economics, supply and demand, contained inaccuracies. Or rather the graphs I published didn’t follow economics convention. The logic was (mostly) right but the graphs were wrong. I rushed out one fix and breathed a sigh of relief. Then last night on my way back from Riga I noticed another flaw. I won’t go into details but I’m now fixing/fixed it. Several times in the past I’ve attempted to capture my thoughts on software economics but nothing I’ve ever written has seen the light of day. As I continue this analysis I’m finding more insights I hope to share. I’m also - possibly - making errors. 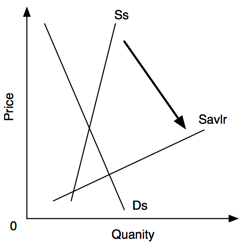 I hope other readers who think they know economics can help debug my posts. They will be better for it. 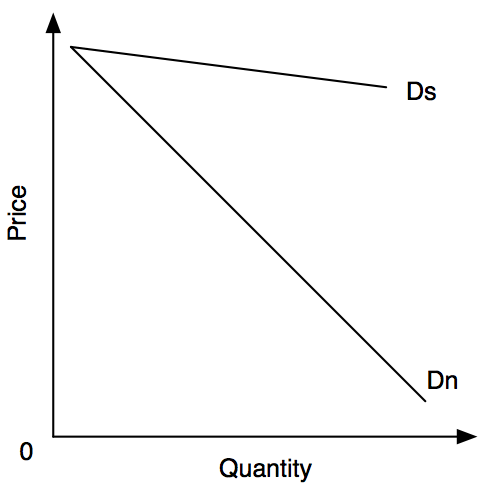 Having outlined the theory of supply and demand in the software market I want to spend this, and the next few posts examining what this analysis can teach us. I’m starting with the supply curve and will look at the demand curve later. Over time changes to software systems will add code, this means there is more code to maintain, more code for engineers to understand, more code for testers to test. Internally code quality tends to decay, some people call it software entropy. Engineers leave the team and new engineers (might) arrive thereby loosing knowledge of how the system works. At least the knowledge is diluted. And if maintenance is outsourced or offshore such knowledge may be destroyed altogether. The new, cheaper, outsourced developers need to relearn. Meanwhile the business environment seldom becomes any simpler. New business rules get added one place or another - increasing complexity. New systems need to be connected - either as data sources or destinations - which again increase complexity. This all gives rise to the Big Ball of Mud pattern. Finally technology changes. The operating system and databases which form the foundations of the system may be upgraded or replaced. In the worse cases the language the system is written in dies. The net result of all of this is that the system becomes harder to maintain. Harder translates to more time and more time translates to more money. Thus the system becomes more expensive to maintain. 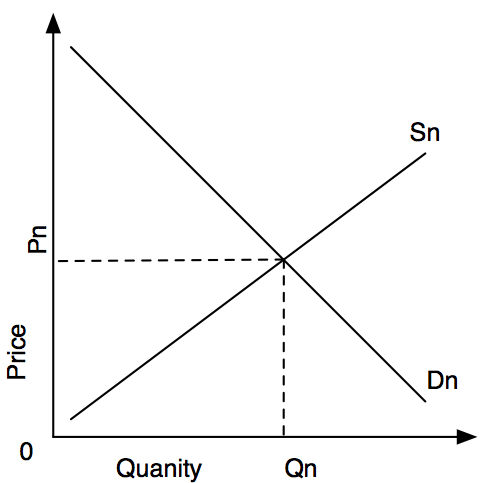 Consequently the supply curve for the system moves to the left. For the same price we can now get less software. Consider the graph below. 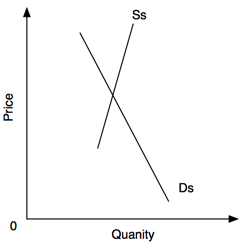 We have the Supply of Software (Ss) and Demand for Software (Ds) curves as before. 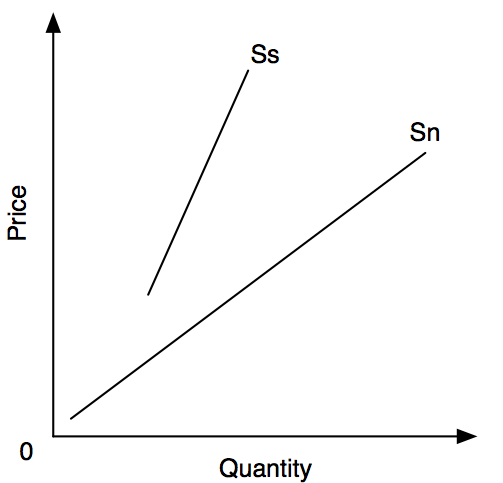 Now we add the Supply of Software over Time (Sst) curve. Over time, of nothing is done, the curve itself moves, all other things being equal we do not move to a new position on the curve. We get an entirely new curve. But either way: unless you fight it things will get more expensive for the same quantity of software - or you get less software for the same money.